I received a brief and surprising email today. The first surprise was that the email arrived at all. You see, I’d emailed Elizabeth Strout, whose complex and often lovely novel in stories Olive Kitteridge. (If you haven’t read Olive Kitteridge, I highly suggest it. There’s a reason it won the 2009 Pulitzer for fiction.) I’d contacted her to see if she was interested in being interviewed for this blog, since she had published a number of short stories while teaching as an adjunct at Manhattan Community College (and being a wife and mother). The second surprise was that Ms. Strout managed to turn down my request for an interview graciously: she expressed gratitude for being asked, but indicated that her work schedule was “too strict” to take part in such an interview at present. In between classes today, I visited a number of humor sites, for a much needed break. I also visited a blog for freelance writers, the Renegade Writer blog. There I read a post from Linda Formichelli, a nonfiction writer who is a bit of a name as a professional nonfiction writer. She’s published half a dozen books, and regularly writes for magazines such as Wired and Family Circle. Today’s post discussed Ms. Formichelli’s recently commitment to cutting back her writing time while maintaining her income, so that she could spend more time with her young (one-year-old) son. She did this in part through stopping her visits to an online writers’ forum (which she found too addictive), as well as stopping her visits to…some of the online humor sites I’d visited today. Hmm. To be fair, eliminating her Web habits weren’t the only changes she made. Formichelli also recruited help in changing her habits and increasing her level of focus (from her husband and a writing buddy). However, the synchronicity of the two writers made for a message even I couldn’t miss, dense though I may be. Having young children—as Formichelli does, and Strout did—is one of the more universally acknowledged ways to disrupt both your focus and control over your time. New York, where Strout lives—is a city seemingly designed to seduce one away from plans with its explosion of temptation, and I can’t imagine living there on adjunct wages. (Ye gods!). 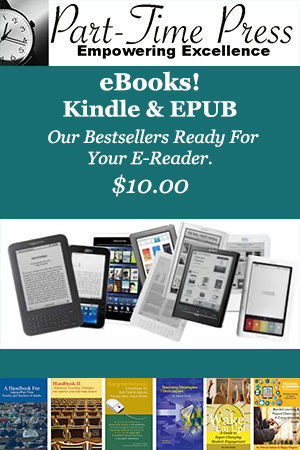 That said, Strout managed to make major strides towards being a writer who would win top prizes in American literature while still an adjunct, while Formichelli managed to cut her work week back markedly while maintaining her income…at a time when the magazine publishing world is imploding. I therefore thank Elizabeth Strout for turning down my request. I’d rather have another page written on her next book than an interview with her—and her lesson for adjuncts is as clear as any one could want. 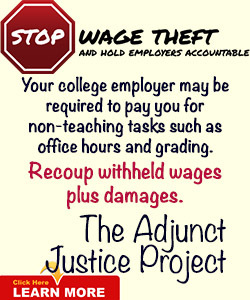 Adjuncts can write. 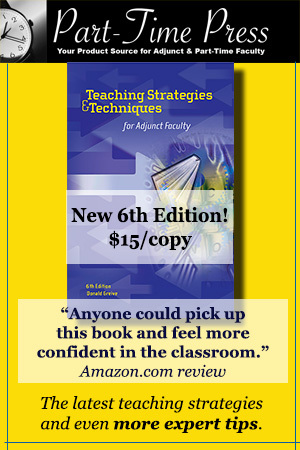 Adjuncts can write great things—if they take control of their schedule. And though she’s a freelancer rather than an adjunct, Linda Formichelli would agree. Yes, adjuncts can write, and some like Elizabeth Strout (and Grace Paley and more) are doing it at a high level. Alas, I am still “wasting time” reading online and also hoping to get news of my IPPY Gold Medalist, Fight for Your Long Day (Best Fiction from the Mid-Atlantic Region), out to adjuncts and others. 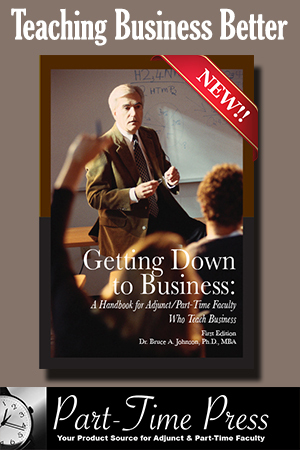 It’s the only academic novel written by an adjunct and told consistently from the adjunct’s perspective and deals with so many adversities faced by students and teachers in the 2000s. In it, Cyrus Duffleman navigates five jobs at four universities in one day while surviving our “war on terror” and much more. Time management is important for everyone. Writers especially can be pulled in many different directions. Because we must be self-directed, we also must be disciplined, and this includes knowing when to say No.